Finally getting the Q ticked off! 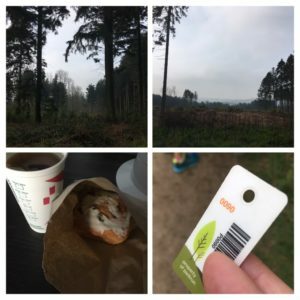 Last year I got more into parkrun tourism, and with that came all the little extra challenges that go alongside it. I was keeping half an eye on the alphabet, noticing that I was gradually ticking a few off, but not really actively chasing any letters. Then last Easter I fancied visiting a new parkrun and decided to look into the letters that were close by. I ticked off O at Oak Hill, and then N at Northala Fields. Handily on our trip up to Scotland last year we came home via York (on the Friday night) so I ticked off the Y, and then in the summer we had a weekend booked in London (to see The Muppets) and so I went to Valentine’s (it was going to be Victoria Dock as we were staying close by, but they had to cancel the event that week). I also made the trip around the M25 to Upton Court and got my D at Dinton Pastures on the way to the Bath Christmas markets. Jersey Farm started in St Albans, so I’ve been there a few times, ticking off the hard-to-get J. As I have ticked more letters off, I’ve paid more attention to other letters, although of course it could happen more naturally (Dunstable Downs started more recently, so I now have two D’s). I’d planned a trip to Queen Elizabeth parkrun over a year ago, but it turned out where we were staying was right by Portsmouth Lakeside parkrun, and it seemed a little silly to get up and drive when I could just run around the corner (plus the check out was 11 so it was less time to get back after and shower etc). We then thought I could go on the weekend of the New Forest 10k, but that didn’t work out in the end. Anyway, I finally managed to tick it off last weekend! I drove us down to Portsmouth on the Friday night, and then on the Saturday morning I drove up to the park. I did have a brief moment where I considered whether what I was doing was entirely sane or sensible, because the Portsmouth Lakeside parkrun route was right next to where I was, but it was only a 20 min drive (if that) so it wasn’t too far. I had followed the postcode given on the course page, but then followed the brown signs once I got close, and inadvertently ended up parking in a different car park (I didn’t realise there was more than one). A few other runners were wandering about, asking where the start was. The directions said something about 100m along the gravel path from the corner of the car park, so we found a path and wandered along it. After walking 1/3 of a mile (and slightly worrying that I’d miss the start) I saw the actual car park with the little path going from it up to the start area. Phew! 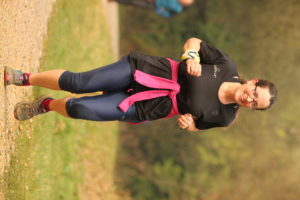 I was still a bit full of cold, so wasn’t going to go fast at all and was standing near the back of the runners so as not to get in anyone’s way. 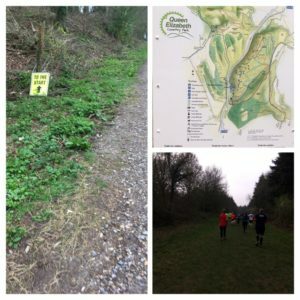 I saw someone who looked like one of the RD’s from Panshanger, and then at the run briefing it turned out it was him because some of the Panshanger core team were cycling the South Down Way and visiting the parkrun on their way. They are all super speedy and I was starting at the back so I didn’t get a chance to chat, but it was a bit of a coincidence. I couldn’t hear the briefing that well down to a few barking dogs (even though the RD asked the noisy ones to go up the hill and wait at the start) and my ears were still a bit blocked. I heard words such as “hill”, “steep”, “loose ground”, “hill again”, “second lap”. I just follow the person in front and I knew it was vaguely two laps. 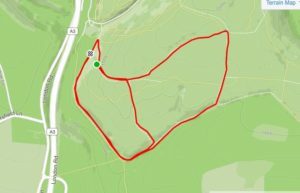 The route we did started up a hill ( a bit like Heartwood Forest), along forest-lined tracks, down to the start area, up the hill again and then on a slightly bigger loop, so it could be like Ellenbrook Fields in that respect with a small then larger loop. I kept having to slow down to get more tissues out of my pocket, and on the second go of the hill I stopped to take a few photos as the views were so pretty, even though it was fairly overcast. It reminded me of Wendover Woods in that respect. From their facebook page- somehow they won’t rotate! Although you can see from the Strava elevation profile that it goes up a fair bit, the final mile is fairly downhill (but with a bit of uneven ground here and there) and I did manage a speedier final mile, before heading back to the car. There was a little mix up with results so although I had token 90 I ended up with position 89 and a time of 32:59. It was then time to head back to the hotel- Andy had been to the Starbucks in the lobby for a cinnamon roll- what good service! If you are interested you can see the page with all my parkrun tourist visits here. I now only need I and K in this country, plus the Z- not quite sure how I can wrangle that just yet! I’m enjoying all the various challenges available- I only need one time to complete stopwatch bingo, and if I visit two more C’s I’ll become a pirate. If only there was more than one Saturday each week! Are you tempted by any of the parkrun challenges? 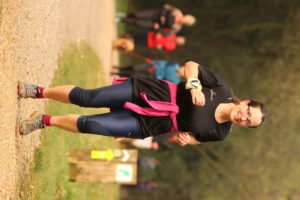 Author Maria RunsPosted on April 12, 2019 April 14, 2019 Categories General ramblings, Running, Stuff I love! Yay for your Q! I was lucky in that I was familiar with the park before doing the parkrun so I knew where they meant, but I agree it’s confusing. Especially as that car park is the first one you see when you come in! Bingo is so frustrating! I only have one number left but I’ve been like that for ages it seems! I keep meaning to visit QE as I have a friend who runs regularly there. I recently ran Ipswich as I have another friend there and we were staying in the area. The chap giving the new runners briefing asked if I was doing the alphabet challenge and was surprised when I said no! I guess they get a lot of tourists as a result of them beginning with an I. Yes, I think there are now 3 I’s so it’s a rare letter to get! I think most of the tourists at QE were hunting their letter Q! It’s a lovely place to visit, but not a fast course! I’ve been stuck on 3 to go for my bingo for ages! !